“Yes, you can,” he replied. He then informed me of the Church’s decision to open the media room to all reporters, including females, during the priesthood session. 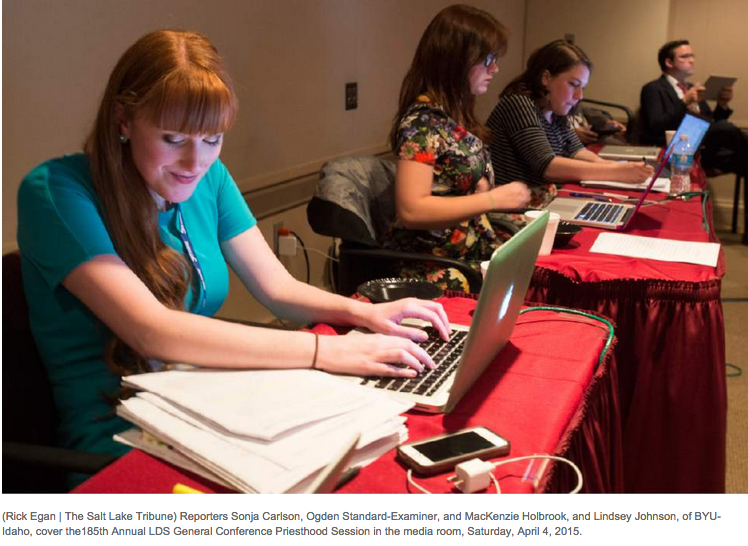 The decision was made to make the priesthood session mirror the women’s session, as it would be open to all reporters this year as well. In the past, they closed the media room for both sessions to make it equal. I thought about it a bit before telling my editor I would love to go. I realized if I said no I’d be missing out on a wonderful opportunity. He told me he wanted me to go for the historical aspect of it, since it was the first time female reporters would be officially allowed in. I’ve covered conference in the conference center’s media room before for other outlets and loved it, so I was excited. My biggest takeaway as one of the four women there? The priesthood session is just like any other session of conference. There really isn’t much else to it. I had a few people tell me this before I went, and I knew it. However, witnessing it in person simply solidified the views I have had for a long time on the priesthood and gender roles within the Church. I realized that the men and boys attending the priesthood session were going for the same reason we all — male AND female — go and listen to the other sessions: to receive guidance, be uplifted and to hear words from living prophets. I believe they also attend to fulfill their priesthood duty, but you know, that’s no biggie *heavy sarcasm*. I loved the spirit I felt there. To me, it was like the Church was showing that there is nothing to hide about the priesthood session (and um, hello, they’ve been broadcasting it for all to see for a little while now). Did I feel strange walking out of the conference with a sea of men? Of course. But was I treated any differently because I was a woman? No. I have wanted to write about women and the priesthood for a long time, but I’ve either a) not known how to accurately voice my opinion or b) been afraid that others might want to argue with my sweet and simple views. But that’s me not holding up my side of the bargain I made at baptism — to stand as a witness of God at all times, in all things and in all places. I don’t want to delve too much into it because I see it so simply. And no, I am not brainwashed into having the opinion I do. I am an endowed member of the Church and have spent countless hours in the temple learning about how important women are to men and vice versa. And how both sexes are vitally important to the Lord’s plan. Women in the Church who desire ordination to the priesthood blow my mind. Because really, I feel they must not understand or believe in the temple ordinances as they should. I, as a woman, do not need to participate in the priesthood the same way men do to feel loved, accepted, or fulfilled in my calling in Zion. I am more than comfortable with my role as a woman in the Church. (And that’s coming from a single, childless woman in the Church, by the way.) Are there some cultural, gender-based aspects of the Church that don’t sit well with me sometimes? Kinda. But get this — the Church is just that, a church. I have a testimony of the gospel OF the Church. The Church is full of people who are not yet perfect. There will be times when everyone will not agree with each other and those who have been raised differently from the norm will get offended. People will say things they probably should have thought twice about before uttering and people will also leave before they allow the Atonement to work for their daily lives. I respect the men in the Church who are ordained to the priesthood and honor it. In turn, I have never felt disrespected as a woman who isn’t. I am honestly and genuinely sorry for those who have been. I guess what I want to make sure people know is that I have a love for and faith in the gospel and my Savior Jesus Christ that transcends any worldly opinions. What matters most to me is what my Savior thinks of me, and how I return to Him. I wholeheartedly believe that His plan is the right plan, and that it is not flawed. Because like Him, it is perfect. I care more about following Him than worrying about whether or not I am treated the same as men are within the Church (even though I believe I am). I pray that my thoughts and feelings have come across accurately, as they are very sacred to me. I also hope that they have not offended anyone, as that has never been my intention and I still love and respect those who have different opinions than I do. There is so much more I could say on the subject, but not much more I need to. 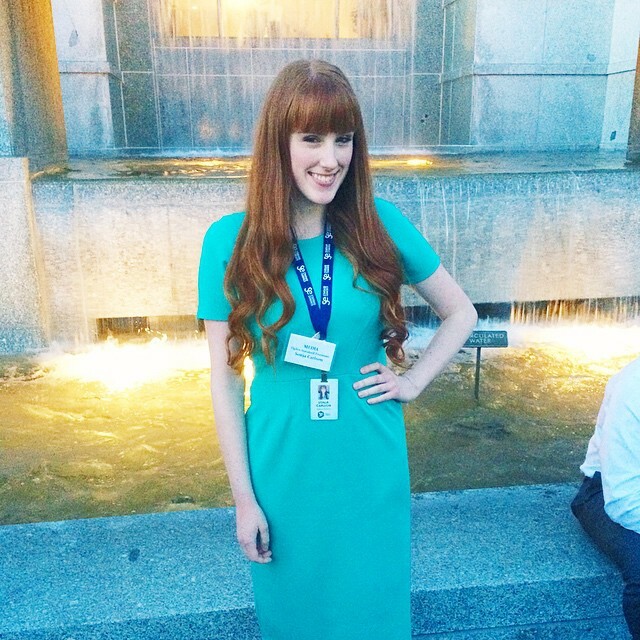 I am proud to be a woman who belongs to The Church of Jesus Christ of Latter-day Saints. That’s it. For some quick highlights from the priesthood session, read my summary. While the talks were directed towards men, I feel they can relate to women and their roles just as well! It was a fabulous session that I need to re-watch myself. Check the full session out on lds.org. And here’s the article (if you can even call it that) the Trib wrote on the big to-do: Who were the four women who got into the all-male Mormon priesthood session?